November 17, 2000 the NCAS decided to try and calculate how high a meteor is when it 'streaks' across the sky. 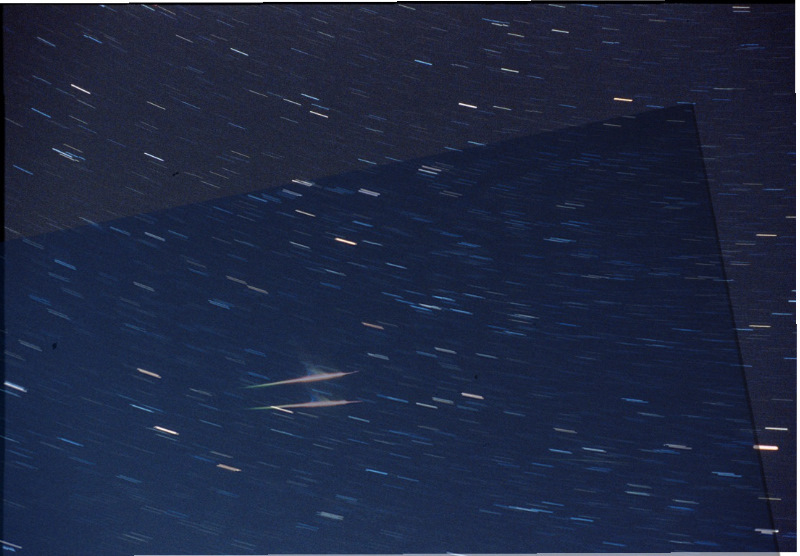 during the Leonid meteor shower. . . . .
in 1932, 1733 and 1866. In 2001, Earth will move more directly through streams from 1767, 1699 and 1866. Harold Porter: Who calculated where to point in the sky at 10 minute intervals and I will include them,visited sites. Dave Chamness- imager Ft. Collins. Terry Moore - handled the ham radio & kept Ray alert. Ray Warren- provided the cameras used by himself for the southern images & Phil OKunewick(north). Phil OKunewick- north image of exploding bolide set, did much of the coordination on Terry & imagery. Tom Teters - setup at Cactus flats South I shot two rolls of film, got great resolution and NO meteors. Each of us was about a mile and a half apart. on an approximately east/west line. 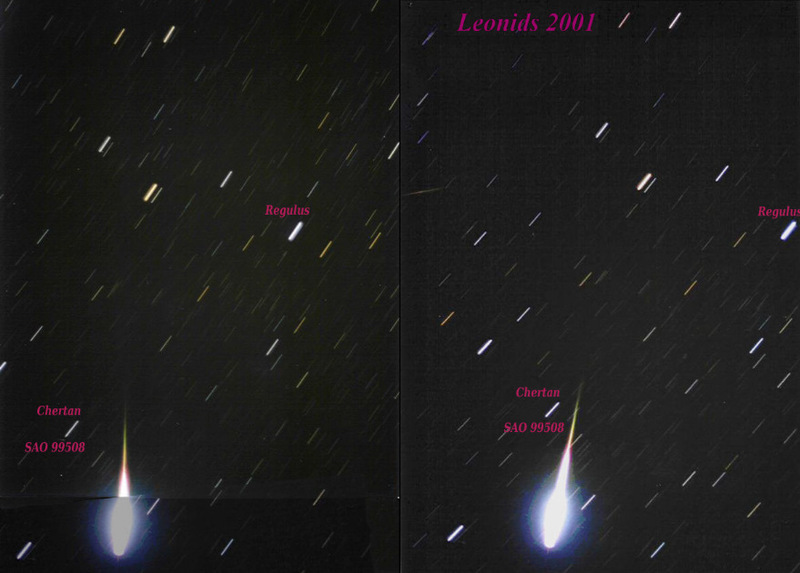 There was only 1 set of images, from 2000 that had the same meteor in them at the same time. 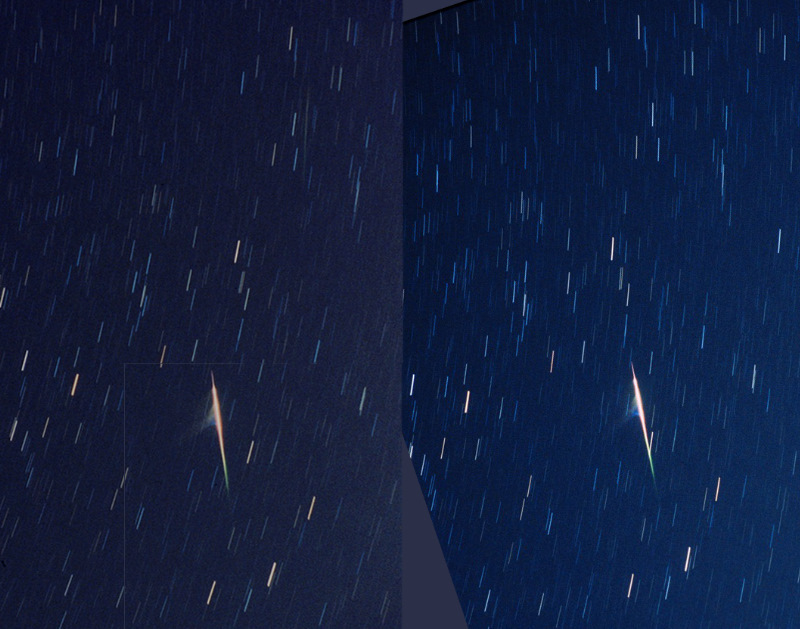 Dave Chamness and Jan Kok took the 'winning shots of the same meteor. Taken from: 40.642265, -105.091354 : Approx;: 40.656892, -105.091530 (1 mile north) Can you cross your eyes and 'match' these images, try moving your head to & fro at the same time. This image directly overlays the starfield, so the angular seperation of the two exspoures can be calculated. 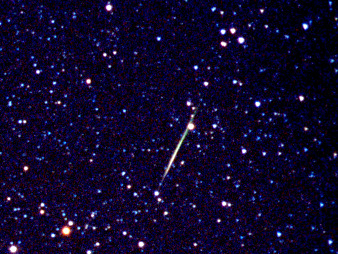 This is a rather bright meteor in Leo, Nov. 17, 2001, @ about 2-3AM local time. It was only caught in its entirety on the Ray's southern camera. This was intended to be a 5 minute exposure, but once this meteor appeared, we closed the shutters. HAM radio was used between the cameras to point the cameras and syncronize the shutters. In the one that has the fireball complete, the surrounding stars are Leo. The hindquarters just above and to the left of the fireball. The question mark is easier to see in the one that doesn't have the whole fireball. That makes the bright star trail just above center on the right side of the frame is Regulus. did much of the coordination. Phil was at the North site with a few others. Ray and I were by ourselves. Never seen meteors like that. the beginning of the track, which is kinda fuzzy. Then it changes colors in a distinct way from green to orange. Then the red halo on the sides blends to the main stream. All of those are identifiable in both pictures. red trail sticking out the front as it finally vaporized the last few bits. The end of that tail is pretty distinct. confirm from that where it was at. is because of the foreshortening of the path caused by my viewpoint. Author's note: I added the bottom part of the left image for purely cosmetic reasons. 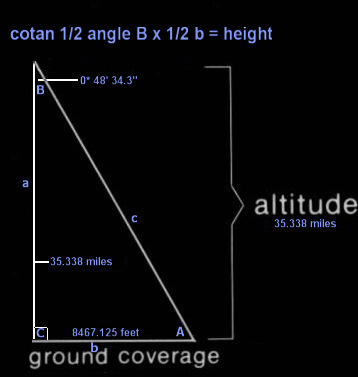 Let's measure the distances in Photoshop & use the Pythagorean formulae. The distance between Regulus & Chertan is: 440.6 pixels, 16* 21'41" or 58,901 arc"
Can we calculate length of meteor trail, now that height is known. Can the height & speed of meteor burn, be used to ascertain of what the meteor is composed? since the air is ionized by the meteor, the color is a direct representation of the elements it is ionizing. Page Page under construction: Sorry for being a bit late Jan. 05, 2011 ..TjT Re-editted 01/17/11.